A dining room is a place where a big part of our life unfolds. A dining room is a special room where family and friends gather together to celebrate life and converse in ways that bond us through eternity. At Amish Furniture Factory, we believe in selling extremely high quality, handmade, heirloom Amish dining room furniture that will be in your family for decades into the future from which your lives will unfold around. Like your family, friends, and life, each piece of Amish made dining furniture is a unique, one of a kind imprint into our wonderful creation that cannot be duplicated or copied by machines or assembly shops. Your Amish dining set will be individually handcrafted using a blend of old and new world techniques and tools. The Amish are still using long lost and longed for Old World furniture building techniques that is so rare in today’s modern home furnishing industry. Old World furniture building techniques have existed many years before any of our lifetimes, and thousands of cherished pieces still exist that were built from that era. The evidence that these antique pieces still exist today that were built using Old World building techniques is substantial enough proof to prove the design, material type and construction methods used is supremely superior to any mass manufacturing process that is used today for dining room tables, chairs, hutches and other dining room furniture. Our Amish dining room chairs and tables are built with a combination of mortise and tenon joints, dove tail drawer joints, dado joints, and a careful and meticulous material selection, and sanding and gluing process. You will see many of our Amish dining room chairs and tables using the mortise and tenon joints in their construction while hutches, buffets, and leaf storage cabinets may have dove tail joints used in the construction of drawers. Mixed with Old World building techniques, today’s modern Amish furniture builders utilize a unique and innovative blend of new technologies and tools that have been adapted to be used effectively with the Amish way of life. It is not uncommon for an Amish dining room chair, table, or hutch and buffet manufacturer to have high tech modern power tools, saws, lathes, or sanders in their work shops. This may come to a surprise to many, but the difference lies in how the tools and machines are powered. The most common way for an Amish furniture craftsman to power their equipment is by using a diesel generator hooked up to a belt to drive the sanders, saws, lathes and other equipment. The precision of modern power tools mixed with the care and delicacy of hand crafting an Amish chair or dining room table will yield a much higher quality, well built and beautiful set than if it was all built by machine, or all built by hand. The most beautiful and cherished piece of dining room furniture, that is often the centerpiece of the room, is the Amish dining room table. Amish Furniture Factory offers one of the best selections of Amish dining room tables on the internet. We have been in the furniture business a long time, and know quality when we see and touch it. With our experience we have hand selected the top Amish dining table manufacturers from an option list of hundreds if not thousands of dining table manufacturers. Within our large selection of Amish dining tables, enjoy browsing through the many styles and sizes we offer, which include trestle tables, single and double pedestal tables, leg tables, and gathering tables. Of course every dining room table must be accompanied by equally beautiful and high quality set of Amish dining room chairs. Many of our Amish dining room chairs are designed to match the style of many of our dining room tables. Creating an Amish dining set makes the process of choosing the best Amish dining room chair to go with your table a snap. We also encourage our customers to mix, blend and experiment with different styles to arrive at a slightly edgy look or feel. Don’t forget to check our Amish Dining Sets subcategory where we may already have your perfect dining room table chair and set ready. room table chair and set ready. If you are looking for more storage or organizational space for you dining room or kitchen area, please browse through our Amish Cabinets, and Hutches and Buffets subcategories where you will find additional Amish dining room furniture pieces to accessorize or supplement your Amish dining set. Why stop accessorizing with our cabinets, hutches and buffets? In our Amish dining room category you will find additional subcategories full of quality Amish handcrafted products that will compliment your Amish dining set. 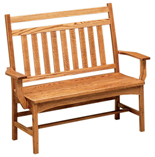 The pieces include our popular Amish seat back benches, slab benches, lazy susans and our carts and serving trays. Each of these pieces is an excellent way to add additional functionality, style, charm, beauty and fullness to your inspired and one of a kind Amish dining room.